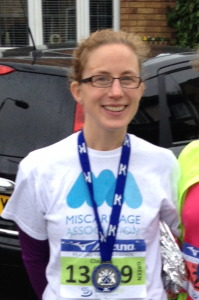 Claire Guile ran the Reading Half Marathon on March 2 2014, raising awareness of miscarriage and funds for the Miscarriage Association. I decided to run a half marathon as a challenge for my 40th birthday year, having never run before! Many people were amazed at the prospect of me running a half marathon and I soon realised that I could raise some money at the same time. I chose the Miscarriage Association, as it is a charity that helped me in a really awful time of my life. I suffered three recurrent miscarriages and was shocked at the lack of understanding I received from professionals and friends alike. I wanted to raise awareness of miscarriage and the pain and suffering it causes to so many people. Women and their partners need support and acknowledgment, it should not be a taboo subject. It is simply not a medical mishap, it is a deeply emotional and delicate time. I wanted to wear the Miscarriage Association t-shirt to show people that it’s ok to talk about and there are people willing to listen and help. Many strangers approached me on the day and said what a good cause I was running for. I agree with them.